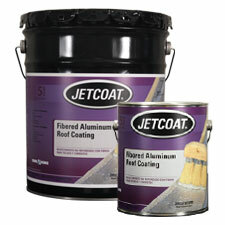 A blend of pure waterproofing asphalt and high grade aluminum pigments plus the addition of fibers. This material will reflect up to 80% of the sun’s rays, helping prevent excessive drying and cracking of substrate, thus reducing leaks. Areas immediately under roof will remain approximately 15-20 degrees cooler in summer. In winter, inside heat is reflected back into the building, thus saving energy costs. Dries Bright Silver. 65215 4.75 gal. Pail 49 lbs. 65211 .9 gal. Can 9.5 lbs.